As a student of watercolor looking to grow your skills, you know that there's no substitute for experience. Time and practice are the biggest factors in developing competence in this dynamic and beautiful medium. However, as you work to log those "brush miles," you can grab advantages that will impact your art for the better and give an instant boost to your paintings. Give your painting skills an instant boost! One of these boosts comes from upgrading your brushes. If you've been using synthetic, general-purpose watercolor brushes, you're working with an affordable, easy choice. Synthetic brushes come in all kinds of shapes and sizes, but they have in common a "snap" in their bristles that gives a feeling of more control to new painters. New painters like control; there's an appeal to intention that determines how every brush stroke should be placed; it feels like expertise. It's funny that as I grew my skills as a painter, control became less important. Suddenly, a brush with "snap" started to feel too predictable, my brush strokes too deliberate, almost forced. Dissatisfaction is what drives change so often for artists; we need that feeling of yearning for "something more" to push us to change and grow beyond what feels comfortable. Dissatisfaction pushed me to pull out a brush that I'd bought years before and never used, a whippy squirrel blend that had felt like a wild thing on my first try, and suddenly now felt right, creating marks that I'd never be able to plan on my own. What's the difference between natural and synthetic paintbrushes? There's a different feeling to a natural hair brush. Natural hair (squirrel or sable is most common) is softer than synthetic, creating more organic brush strokes. Natural hair also holds more water, delivering a longer painting time from one loaded brush. When a natural brush is loaded with paint & water, it gets this beautiful full shape that is so ready to express paint to the painting. It's a marvelous thing. How a brush wears will be different depending on whether it's natural or synthetic. A natural hair brush is more susceptible to wear, and a round brush that starts out with a fine point will grow more rounded as the hairs wear down with use. A synthetic brush will usually wear more slowly, and the bristles sometimes fray and develop a fuzzy split end instead. Cheaper brushes are also more likely to loosen around the ferrule (the metal sleeve that holds the bristles). Brushes should never be left standing in paint water as that will bend the tips and also cause the wooden brush handle to absorb water and swell, causing a chain reaction of damage to handle, ferrule and bristles. Don't overfill your water containers. The top part of the ferrule should not be submerged in water as water that lingers between ferrule and handle will damage the brush. Don't overload your brush with fresh paint. PIgment embedded in the base of the brush is not only wasted, it will push the brush hairs apart and loosen the bristles. Pre-moisten your palette paint before painting. Trying to loosen hard, dry paint will wear a brush tip more quickly. Misting your palette will loosen the paint on the surface to make it easier for the brush to grab paint. Leave brushes flat to dry. Store upright after they are dried completely in a pencil cup or in a brush roll. The plastic tube that protects your brush when new is not intended for re-use, there's a risk that in trying to re-insert it you will bend the bristles back and damage the brush. How do I know what brush to choose? As you explore the very wide world of watercolour brushes, you have decisions to make. Shape, size and materials will all impact the way the brush works, and what works for one artist won't necessarily feel comfortable for you. Start by making a small change; try a natural hair brush in the same size and shape as your favourite brush, or try a new shape in your favourite brand so that the shape is different, but the feel is still the same. Be patient with a new brush; it will take time to learn the best way to use it. Use it in a variety of painting situations; wet-in-wet first layers, final small details, drybrush, and everything in between. Pay attention to the marks made by painting with the side of the brush as well as the tip; my favourite brushes are versatile at painting in both ways. Note that a good brush used at the wrong time will feel like a bad brush, for example, a too-small brush used to try to establish major shapes in the first layer of a painting. If you're accustomed to a "snappy" synthetic brush, you will need time to train yourself to know what to expect from a softer natural brush. You don't need a ton of brushes! A small collection of excellent brushes will serve you better than dozens of cheaper brushes. I like a few round brushes in a range from medium to large, and some long-pointed "rigger" or "dagger striper" brushes to create interesting marks and lines. Personally, I never use flat brushes, but that might change as I evolve as an artist. Have fun with your brushes! It's so fun to see expressive, calligraphic marks create poetic tree branches, or dabs of vibrant pigment become single-stroke leaves, and you will wield your brushes with more confidence as you develop your playful mark making style. 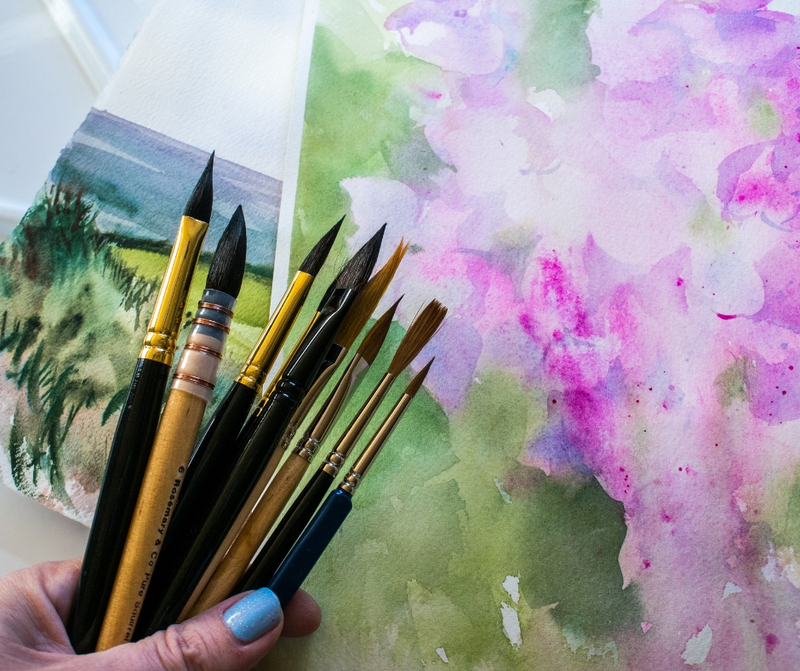 A good brush is a partner in watercolour explorations and you get to work together as a team.